today is 2nd October Gandhi Jayanti. Gandhi Jayanti is a national festival celebrated in India to mark the occasion of the birthday of Mohandas Karamchand Gandhi, who is unofficially called the "Father of the Nation". It is celebrated on 2nd October. It is one of the four national holidays of the country. The United Nations General Assembly announced on 15 June 2007 that it adopted a resolution which declared that 2 October will be celebrated as the International Day of Non-Violence. It is celebrated every year. 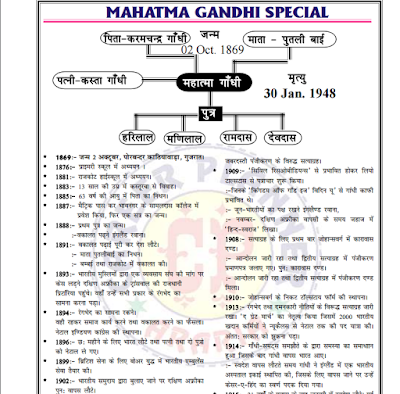 In this post we are sharing a brief facts and events of Mahatma Gandhi and approx 100 MCQs which has been asked in various competitive examinations. You may download it from the link provided below.